Social media blurs the line between our “professional” and “personal” lives. Your social media presence can be multi-faceted, but it should always be a reflection of you. It’s easy to get drawn into an argument on social media. It’s a lot harder to get out, and almost impossible to win. Think before you respond to negative comments. Aim to provide the same level of respect for others that you demand for yourself. Familiarize yourself with the privacy settings of your social media platforms, but know that anything posted online may still be found. Ask yourself if the content you are posting is really true to yourself – would you be embarrassed if it went public? Would you be embarrassing someone else? As per Macalester’s student handbook section on social media policy, neither ITS nor Macalester College assume any responsibility for what students post on social media. Inappropriate material placed on social networking sites is subject to Macalester College’s Responsible Use policy, the Student Conduct Process and the College’s Harassment and Grievance Procedures. Do we need this? Only create a Facebook profile or Twitter account if you think it will fill a need year-round. Are you looking to promote a single event via social media? Contact Communications for ideas on Macalester’s primary social media presence. Consider starting a Facebook group or utilizing Mac Social with the hashtag #heymac. How will we maintain this? Your Facebook page won’t populate itself, and you should be prepared to maintain it and keep it updated. Do you have the staff and the time to maintain a social media presence? Do you have the content? Can you realistically expect to attract and maintain a following? Be Responsible. The social media accounts for your department are seen as an extension of your website and are ultimately your responsibility. The same guidelines that apply to the website apply to your social media accounts. Follow visual identity guidelines and turn to the Communications office for help when you have questions. 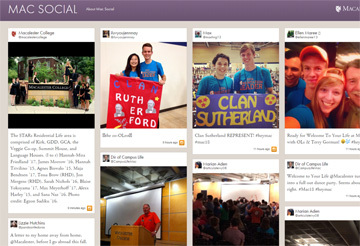 Mac Social is an aggregator of social content—a social “hub” that brings together content posted on social media networks about things happening at Macalester or about members of the Macalester community. Mac Social provides a glimpse of what is happening right now, in the words and photos of Macalester students, prospective students, alumni, faculty, staff, and friends. Mac Social is managed by Macalester Communications and Public Relations. What content is included? How can I participate? On Twitter, you may also mention @macalester in your tweet or use the hashtag #macalester. Or on Instagram, post photos and add the hashtag #macalester. We review these tags and mentions and we will push content out to Mac Social. Mac Social also includes content posted on Twitter, Instagram, and Facebook by the official Macalester College accounts. Our intent with Mac Social is to be broadly inclusive. We do reserve the right to reject items that are not consistent with Macalester’s community standards. Be respectful. We will not post items on Mac Social that are defamatory, obscene, or contain personal attacks or any form of harassment. Be relevant. Mac Social is a forum for highlighting things that are happening at Mac and in the broader Macalester alumni community around the world. Participate; don’t dominate. We may limit posts from a single individual or account in order to make room for a broad mix of community activity. Have fun. Share your Macalester experiences and memories. Show what is unique about the Macalester community. Together, we tell an amazing story.